« Does Julia Cameron Blow Bubbles with Fubbles? “Do you want a date?” That was the question I asked everyone when I walked into my Toastmasters meeting last night. In my hand I had a plastic container filled with soft and sticky pitted Deglet dates that I had just purchased from the co-op. I was going to use them to make my famous ginger tea, which I spike with dates to give a little bit of sweetness. As it turned out no one around me actually wanted a date– everyone declined. But simply bringing these dates and asking that question generated conversation and stories for the entire meeting. 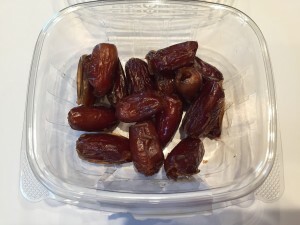 The meeting started, and although no one had eaten a date, the dates were not forgotten. When it came time for table topics, Liz didn’t like the prompt that she was given, so she decided to instead tell us a story involving –you guessed it–dates. It was a wonderful story, but of course any story would be that begins with, “When I was in Egypt working with a battalion that was clearing the fields of buried mines…” She had told our Toastmaster’s club that she had graduated from West Point and served, but stories like this still tend to amaze me. She told the entire story in the two minute limit that we have for table topics speeches. It went like this: they were so tired and hot after five hours of mine sweeping with the Egyptians in the desert that the Egyptians invited the American soldiers to come and have dinner with them. Egyptians are very generous with food she said, but there were items on the table that were totally unknown to the soldiers. Liz said that they started eating the foods they know: “OK, I see an apple, I’ll have some apple slices. And those olives look good. “ But she said there was something soft and brown in the center of the table and she didn’t know what it was, so she “pulled rank” and told another soldier to try it. The brown soft stuff turned out to be dates, and that was pretty much the end of the story, except for Rena’s comment after Liz sat down. Rena said, “Now, I have a date story to tell too!” She decided to not use her table topics time to tell her story, but told us briefly after the meeting. Her story went like this, and also took place in the Middle East, but in Israel, not Egypt. Rena said she worked in a kibbutz after college, and her favorite job was to prune the date trees. To do that, she had to get up very early in the morning before it got hot, and she would need to climb the trees like a ladder and snip them here and there. She said it was just a beautiful way to be outside and to interact with trees and dates, and that was her association with dates. One. Bring snacks to meetings whenever you can because they seem to make people happy and evoke stories to tell. Two. It turned out the dates were a particularly good snack to bring since one could make a joke about the word “date,” which has two meanings, both of which fit well into the sentence: “Would you like a date?” This doesn’t work as well if, for example, if you bring cookies. Because the joke associated with “would you like a cookie?” usually will engender something along the lines of “No thanks, I have my Internet browser set to not accept cookies.” Ha, anemic ha. Three. Food and any and all sensory products (anything that evokes our sense of taste, smell, hearing, feeling, or seeing) are likely to prompt stories. This is because we perceive the world through our senses, so the more pungent, crisp, salty, or loud the story prompt is, the more likely we are to come up with an immediate or past experience to talk about in response to that.